Optional colour scanner with variety of standard features. Very easy to use – large LCD touch-panel. Superb productivity: 6.4 ppm (A1) and 3.4 ppm (A0). 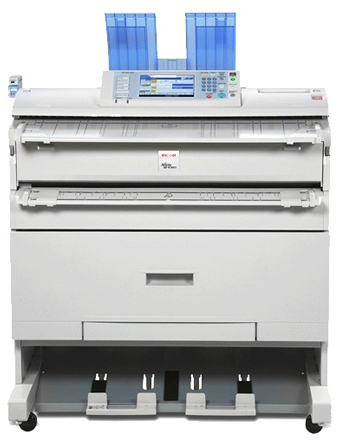 The Ricoh MP W3601 provide the dream combination: affordable wide-format document production in a compact footprint. You can securely copy, scan, distribute and archive with one surprisingly compact unit. With their top-of-the-range optional colour scanner and speed of 6.4 A1 pages per minute, these devices offer productivity improvements for the busy office. You can process a variety of paper sizes from A4 up to A0: opt for the two roll configuration or the additional 250-sheet paper cassette (up to A3). By adopting a London Copiers service agreement – the worries related to printing and document management can be removed. With copy costs assigned to the machine usage we are able to supply parts, labour and consumables hassle-free. Let us manage your print system so you don’t have to.